This article tells the behind-the-scenes tale of the first apartheid Cabinet under Dr D.F. Malan. 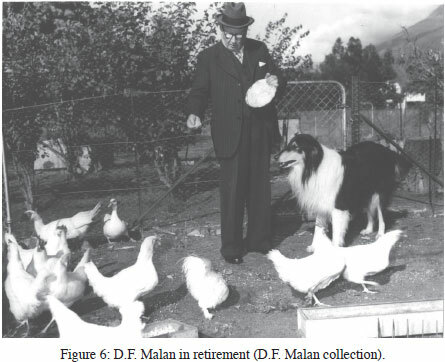 Based on the utilisation of prominent Nationalists' private documents, it traces an ageing Malan's response to a changing international context, the challenge to his leadership by a younger generation of Afrikaner nationalists and the early, haphazard implementation of the apartheid policy. In order to safeguard South Africa against sanctions by an increasingly hostile United Nations, Malan sought America's friendship by participating in the Korean War and British protection in the Security Council by maintaining South Africa's Commonwealth membership. In the face of decolonisation, Malan sought to uphold the Commonwealth as the preserve of white-ruled states. This not only caused an outcry in Britain, but it also brought about a backlash within his own party. The National Party's republican wing, led by J.G. Strijdom, was adamant that South Africa should be a republic outside the Commonwealth. This led to numerous clashes in the Cabinet and parliamentary caucus. Malan and his Cabinet's energies were consumed by these internecine battles. The systematisation of the apartheid policy and the coordination of its implementation received little attention. Malan's disengaged leadership style implies that he knew little of the inner workings of the various government departments for which he, as Prime Minister, was ultimately responsible. The Cabinet's internal disputes about South Africa's constitutional status and the removal of the Coloured franchise ultimately served as lightning conductors for a larger issue: the battle for the party's leadership, which came to a head in 1954. Malan sought to secure the succession for his favourite, N.C. Havenga. However, he was outmanoeuvred by J.G. Strijdom and his allies. Malan's retirement marked the end of an era, while Strijdom's victory heralded a regional and generational shift in power. The men who took power in 1948 seemed a grim lot. 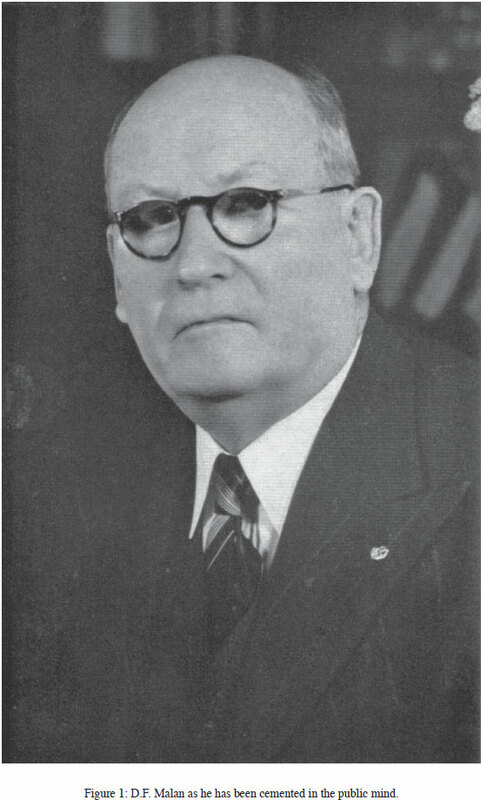 Their leader's unsmiling façade and thick black-rimmed glasses created an aura of austerity - or gravity - depending on which side of the ideological spectrum one stood.1 Judging from their photographs - and the harshness of apartheid legislation - the Afrikaner nationalist leaders created the impression of men who were united in their determination to implement the policy of apartheid in order to protect Afrikaner nationalist interests. Rob Morrell succeeded in capturing this stereotype: 'The South African government was made up of men - Afrikaans-speaking white men. They espoused an establishment masculinity which was authoritarian, unforgiving and unapologetic. '2This article seeks to chisel away at this stereotype by providing a warts-and-all account of D.F. Malan's leadership of the first apartheid cabinet. With regards to the use of archival sources, Thom's research was limited to the D.F. Malan collection in Stellenbosch, the A.L. Geyer collection in the Cape Archives and a few notes which the former editor of Die Burger, P.A. (Phil) Weber, chose to place at his disposal.7The passing of time and the Orange River has enabled this study to utilise the P.A. Weber collection in its entirety, as well as the J.G. Strijdom and N.C. Havenga collections in the State Archives in Pretoria and the H.F. Verwoerd collection in the Institute of Contemporary History Archive (INCH) at the University of the Free State. The excavation of these collections places D.F. Malan and his cabinet in a completely different, albeit more prosaic, light. Other accounts of Nationalist infighting after 1948 belong to the realm of popular literature and memoirs. Ben Schoeman's My Lewe in die Politiek9is the only published account by a member of the Malan cabinet itself. Publications by journalists such as Piet Meiring, Ons Eerste Ses Premiers,10 Schalk Pienaar's Getuie van Groot Tye11and Alf Ries and Ebbe Dommisse's Broedertwis12lend colour to the years that followed, but do not contain the balance, detail or context that a dedicated exhumation of archival documents would provide. Such a history has yet be written. Since the 1970s there has been a movement to demythologise twentieth-century Afrikaner nationalism, both by Afrikaner and non-Afrikaner historians. Dun-bar Moodie's The Rise of Afrikanerdom13attempted to identify various schools of thought within the broad nationalist movement in the era 1934-1948, while historians such as Herman Giliomee,14André du Toit,15 Albert Grundlingh16 and Sandra Swart17 have been producing a steady stream of studies of Afrikaners which dismantle the nationalist narrative of yesteryear, and works such as those produced by Saul Dubow also challenge perceptions of white homogeneity.18 This article seeks to join this tradition through its unromanticised portrayal of the Afrikaner nationalists. It adds its voice to Deborah Posel's groundbreaking study that revealed early apartheid to have been anything but a systematic policy. Posel substantiated her assertion by examining debates about apartheid, contradictions in the Sauer Report and the implementation of the policy at an organisational level.19 Based on my examination of the Afrikaner nationalists' private collections, I concur with Posel's argument that the implementation of apartheid by Malan's regime was haphazard and not, as many believe, based on a blueprint in the form of the Sauer Report. It is clear that the nature and contents of the apartheid policy were related to the balance of power within the National Party. When, after Malan's retirement, the leadership shifted from the south to the north, the northern Nationalists possessed more power than before to shape the policy according to their ideals. However, even more tellingly, my survey of the above-mentioned document collections revealed that, as career politicians, the Nationalist leaders were far more preoccupied by the party's internal power struggles than by the implementation of the policy of apartheid. 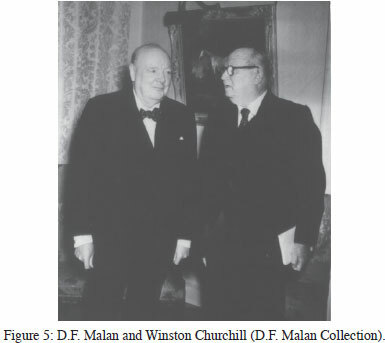 It is thus, building on this finding, that this article examines the world behind the scenes in order to provide a portrayal of Malan's leadership of his cabinet in the years 1948-1954. It is drawn from a recently completed biography of Malan and uses the biographical method to highlight the Malan cabinet's dynamics, its ideological disputes, responses to political crises such as the removal of the Coloured franchise, its uncertainties about the policy of apartheid and its ultimate power struggle for the leadership upon Malan's resignation. A seamless narrative is used as a vehicle to weave all of these complexities together - in this article the historian fulfils the age-old role of storyteller. The republicans were led by a group of Young Turks - most notably J.G. Strijdom, C.R. Swart and their Cape ally, Eric Louw. They achieved leadership positions at a relatively young age by virtue of being nearly the only fish in a small nationalist pond, and when these were threatened, they defended their fortress tooth and nail. Thus, to Malan's horror, they were able to force Hertzog from politics in 1940 by provoking him on the republican issue,25 and staged a palace revolt in 1947 when Malan decided to form an alliance with Hertzog's successor, N.C. (Klasie) Havenga. 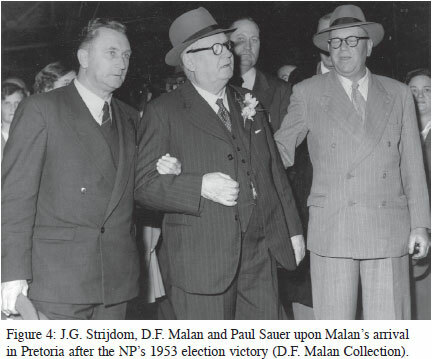 Malan was able quash their rebellion,26 but by the time the National Party took power in 1948, it was deeply polarised, its rifts running along regional lines, which coincided with simmering generational tensions. Malan, for his part, appeared to remain aloof from the chaos raging beneath him. He had always been a reserved individual and he maintained his ever-expressionless façade when Cabinet members told him of their work. He never became involved in his ministers' duties and seldom knew of the doings of the various departments.32 It was a management style that he had maintained throughout his political career, and his tenure as Prime Minister would be no different. Malan would propagate the ideal of apartheid, while those below him were left to implement it.33 In the years that followed, his lack of control over the doings of his government would increase along with his age. Malan, for his part, directed his attention to foreign matters. He held the portfolio of External Affairs, which had been held by his predecessors, Hertzog and Smuts. The administrative head of this department, D.D. Forsyth, generally had a free hand with regards to its administration and appointments, however. Malan seemed to show no interest in these matters.38 His most significant appointment was to name his confidant Dr Albert Geyer as High Commissioner in London.39 Geyer would be succeeded as editor of Die Burger by P.A. Weber, who kept him informed of political developments in South Africa. 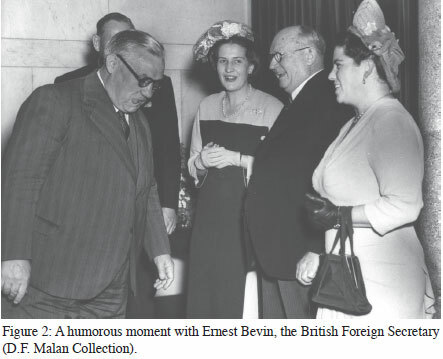 Instead of attending foreign summits himself, Malan dispatched his ministers, Havenga, Dönges, Sauer and Louw - the last of whom had acquired extensive diplomatic experience before his entry into politics - to represent him at international conferences and at the UNO.40 Since Louis Botha's first visits to London, and Hertzog's return from the Imperial Conferences of 1926 and 1931, the Nationalists harboured a fear that their Prime Ministers would be hypnotised by English charm and would return to their country as agents of the Empire. During the 1930s, a congress decision was even taken to prohibit Nationalist Prime Ministers from travelling abroad, and extensive travelling would therefore have made Malan very unpopular.41 In the light of this general aversion, it is understandable why Malan travelled abroad only twice during his tenure. In an even greater departure from this stance, South Africa committed an air squadron to assist Western forces in the Korean War.46 Malan was motivated by the considerations of realpolitik. He justified his decision to Parliament by pointing to the position of the US in relation to the Soviet Union. Malan regarded South Africa as a member of the Western European community, and asserted that Western Europe would be helpless without the US. Thus, if the US declared that China was an aggressor, then South Africa had to support it. To observers, it was a surreal moment. Suppose it was ten years ago, and suppose it was England instead of the US, and Smuts instead of Malan - Phil Weber wrote to Geyer - the Nationalists would certainly have howled that England was holding South Africa on a leash.47 Malan, on the other hand, believed that participation in the Korean War increased South Africa's moral standing in the UNO. The UNO's attacks on South Africa, concerning its Indian population and the administration of South West Africa, continued unabated during Malan's premiership. He was angered by what he considered to be ill-informed criticism, and illegal meddling in South Africa's domestic affairs, by an organisation that he was convinced only cared about people of colour and was therefore intent on ramming racial equality down the throats of Africa's whites.48 He dismissed the UNO as an impotent body on numerous occasions,49 and snubbed its efforts to bring South Africa to book. As far as Malan was concerned, it could hardly impose sanctions on South Africa after her contribution to the Korean War. Only the Security Council could make such a decision, which would force Britain to choose between the UNO and the Commonwealth.50Thus, to Malan, association with Britain not only spelt a valuable economic partnership, but also protection from economic sanctions by the UNO. Yet, it was not only his fears of leaving his party to a man whom he resented that caused Malan distress. He was also angry at the way that he was being prodded and forced to adopt a particular stance by the same men who had caused Hertzog's humiliation ten years before. He believed that they had now decided to do the same to him by organising an underground movement against him - but he would not allow them to force him down the same path as Hertzog.70 Malan persisted in forcing the republican issue through the caucus, and refused to be deterred: it was Strijdom who had to give way.71 The caucus finally issued a statement that the party would continue to adhere to the republican ideal, but that the watershed of 1949 made the republic and Commonwealth membership two separate issues which could be dealt with at the appointed time - and the decision would be determined by future circumstances.72 Peace was restored, but the party remained polarised. Citing figures seemed to be the standard response to criticism: £3.5 million had been set aside during the previous year to improve farming conditions in the Reserves; another £2 million went into old-age pensions. Extensive loans were granted for housing, while medical treatment was also provided to Africans, mostly free of charge.90 Yet, Malan never investigated the infrastructure that provided these services. Malan was not ignorant of the fact that his time to leave the stage was drawing nearer,124 and he began to prepare the way for his exit. If he had to leave, he wanted to determine both the manner in which he departed and the man to whom he would hand over the reins. His altercations with Strijdom had made his premiership a burden, and it convinced him of the need to keep the party from Strijdom's hands. He now believed that he finally had proof of the Republiekeinse Strewersbond's existence, and that it was indeed aimed at promoting Strijdom into the leadership. Others doubted whether such an organisation existed. There was little need for a secret organisation to secure Strijdom's leadership, as representatives from the Transvaal formed the largest bloc in the party caucus, ensuring Strijdom of a victory. Malan did not view the question of his succession in such strategic terms - he was convinced that leadership had to be determined by merit,125 and he considered a man like Havenga far more meritorious than Strijdom. When the Cape National Party met for its annual congress in November 1953, Malan resigned as its provincial leader and determined that his successor had to be elected by secret ballot. The two candidates represented the Malan and Strijdom camps - and the former won. Dönges defeated Eric Louw by 195 to 45 votes.126 It was a sign that the Cape Province remained loyal to Malan's direction. D.F. 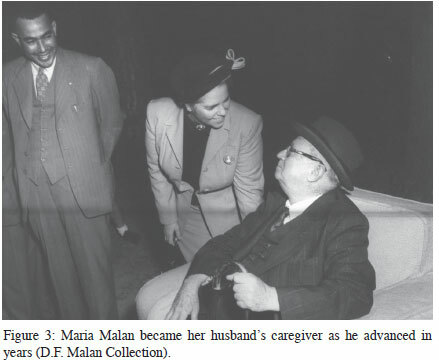 Malan was an aged politician when he took power in 1948. The wider world was changing and, to him, had become a hostile place. As Prime Minister he maintained the disengaged management style he had practised while in opposition. Thus, he exercised little control over a polarised Cabinet and spent most of his energy staving off the onslaught of a younger generation, to whom he was reluctant to pass the baton. There was little coherence when it came to matters of policy and politics in the first Nationalist Cabinet. Hence, there were disputes about South Africa's Commonwealth membership and the methods to be followed to remove the Coloureds from the voters' roll, while the policy of apartheid remained open to various interpretations. Yet these issues served as a lightning conductor for an even larger issue: the National Party's first succession battle. The Afrikaner nationalists were career politicians and, true to their trade, matters of power were always their primary concern. Lindie Koorts (née Korf) was awarded her DPhil degree in History by the University of Stellenbosch in March 2010 for a thesis entitled 'D.F. Malan: a political biography'. It is the first cradle-to-grave biography of Malan - the first biography of an apartheid leader written in a post-apartheid context. 4 See the chapter entitled 'Afrikanermens' in Thom, D.F. Malan, 41-57. 6 Thom, D.F. Malan, 155-187. 7 See the references in Ibid., 206-225, 288-307. 8 See the five volumes O. Geyser and A.H. Marais, eds., Die Nasionale Party Deel I: Agtergrond, Stigting en Konsolidasie (Pretoria: Academica, 1975); [ Links ] J.H. le Roux and P.W. Coetzer, Die Nasionale Party, Deel 2: Die Eerste Bewindsjare, 19241934:I (Bloemfontein: Instituut vir Eietydse Geskiedenis, 1980); [ Links ] le Roux and Coetzer, Die Nasionale Party, Deel 2: Die Eerste Bewindsjare, 1924-1934:II (Bloemfontein: Instituut vir Eietydse Geskiedenis, 1980); [ Links ] Coetzer and Le Roux, Die Nasionale Party Deel 4: Die 'Gesuiwerde' Nasionale Party, 1934-1940 (Bloemfontein: Instituut vir Eietydse Geskiedenis, 1986); [ Links ] Coetzer, Die Nasionale Party, Deel 5: Van Oorlog tot Oorwinning, 1940-1948 (Bloemfontein: Instituut vir Eietydse Geskiedenis, 1986). [ Links ] The same trend was followed by the Institute's two-volume biography of JBM Hertzog, le Roux, Coetzer and Marais, eds., Generaal J.B.M. Hertzog: Sy Strewe en Stryd (Johannesburg: Perskor, 1987) which overlaps with the volumes that trace the history of the National Party. [ Links ] The C.R. Swart Collection, which is an indispensable source in studying the history of the National Party, is utilised by these authors. However, once the documents in the Collection begins to trace Hertzog's descent into senility, and its role in his and Malan's failed attempts to reunite their parties in 1939-1940, the Collection and its contents are, tellingly, ignored completely. For an account that does make use of these documents, see L. Korf, 'D.F. Malan: A Political Biography', 387-400. 14 See for example H. Giliomee, The Afrikaners: Biography of a People (Cape Town: Tafelberg, 2003), [ Links ] which also incorporates Giliomee's earlier research on Afrikaner nationalism. 25 See Korf, 'D.F. Malan: A Political Biography', 387-400. 27 Malan argued that E.G. Jansen, the leader of the National Party in Natal, had to be considered a Transvaal appointment, since his constituency was in the Transvaal. See Thom, D.F. Malan, 211. 29 Schoeman, My Lewe in die Politiek, 156. 32 Ibid., 181-2; Schoeman's assertion - that Malan was mostly unaware of the workings of the various government departments - is borne out by a survey of the D.F. Malan Collection. Cabinet ministers had to circulate memoranda among one another, and while Malan kept many of these, one is struck more by what is absent than by what is present. A survey of Hansard during the six years of Malan's premiership reveals that he participated in only two parliamentary debates that were related to apartheid legislation: the Group Areas Bill and the Separate Representation of Voters Bill. He confined himself to debates that were related to his twin portfolios as Prime Minister and Minister of External Affairs. 33 Malan established this leadership style during his early years as a politician: he seldom became involved in the administrative minutiae of any organisation. Instead, he would provide the impetus and inspiration for a project and then leave it to those below him to thrash out the details. Prominent examples are his disinterested editorship of De Burger and his role in the establishment of the Helpmekaar organisation, but his lack of involvement thereafter. See DFM, 1/1/32689, Danie Malan, Herinneringe aan my Vader, 84 and L. Korf, 'D.F. Malan: a political biography', 186-188, 193. 37 See Posel, The Making of Apartheid, 1948-1961: Conflict and Compromise, 1-22. 54 Schoeman, My Lewe in die Politiek, 163-6. Schoeman's account of the events conflates two separate clashes between Malan and Strijdom about the matter of the Commonwealth - the first clash took place in 1949, the second in 1951. 57 Central archives repository (hereafter SAB), J.G. Strijdom Collection, A2, Volume 53, D.F. Malan - J.G. Strijdom, 11 January 1951 [translated from the original Afrikaans: my translation] [ Links ]. 67 W.K. Hancock, Smuts II, The Fields of Force, 1919-1950, 507. 78 US Library, P.A. Weber Collection, 296.K.Ge.111/2, P.A. Weber - A.L. Geyer, 16 November 1952. [ Links ] Documents relating to the Defiance Campaign are glaringly absent from the D.F. Malan Collection, which casts doubt about the impact of the campaign at Prime Ministerial level. The Minister responsible for dealing with the uprising was the Minister of Justice, C.R. Swart. 80 US Library, P.A. Weber Collection, 296.K.Ge.40, P.A. Weber - A.L. Geyer, 3 February 1951 [Translated from the original Afrikaans: my translation] [ Links ]. 81 US Library, P.A. Weber Collection, 296.K.Ge.111/2, P.A. Weber - A.L. Geyer, 16 November 1952 [Translated from the original Afrikaans: my translation] [ Links ]. 82 US Library, P.A. Weber Collection, 296.K.Ge.112/1, A.L. Geyer - P.A. Weber, 21 November 1952 [Translated from the original Afrikaans: my translation] [ Links ]. 85 P.A. Weber Collection, 296.K.GE(113), A.L. Geyer - P.A. Weber, 4 December 1952 [Translated from the original Afrikaans: my translation] [ Links ]. 88 Meiring, Ons Eerste Ses Premiers, 87. While the letter was issued, and later published, under Malan's name, Piet Meiring claimed that he, as Director of Information, drafted the text, to which Malan gave his approval. 91 Giliomee, The Afrikaners, 484. 94 Ibid. [Translated from the original Afrikaans: my translation]. 96 US Library, P.A. Weber Collection, 296.K.Ge.113, A.L. Geyer - P.A. Weber, 4 December 1952 [Translated from the original Afrikaans: my translation] [ Links ]. 106 Schoeman, My Lewe in die Politiek, 188-90. 108 As Posel pointed out, the Nationalists held divergent opinions about apartheid and what it entailed. According to his 1953 election speech, Malan, for his part, did not see any difference between apartheid and Hertzog's policy of segregation in the 1920s - he had merely adopted a new name in order to rid the policy of the negative connotation attached to the word 'segregation'. This explains why Malan did not attempt to address the inconsistencies contained in the apartheid policy or to develop it into a coherent ideology. 110 Schoeman, My Lewe in die Politiek, 194. 113 Davenport and Saunders, South Africa: A Modern History, 382. 118 Davenport and Saunders, South Africa: A Modern History, 383. 120 CAD, A.L. Geyer Collection, A1890, Volume 5, Diary: 31 May 1953 [Translated from the original Afrikaans: my translation] [ Links ]. 122 Schoeman, My Lewe in die Politiek, 181. 123 CAD, A.L. Geyer Collection, A1890, Volume 5, Diary: 14 June 1953 [Translated from the original Afrikaans: my translation] [ Links ]. 129 Pretorius, Die Malans van Môrewag, 102. 130 Schoeman, My Lewe in die Politiek, 174-5, 202. 133 Schoeman, My Lewe in die Politiek, 203. 136 US Library, P.A. Weber Collection, 296.K.Ge.202, P.A. Weber - A.L. Geyer, 17 October 1954 [Translated from the original Afrikaans: my translation] [ Links ]. 138 Schoeman, My Lewe in die Politiek, 170. 145 Ibid. ; Schoeman, My Lewe in die Politiek, 203-4. 146 SAB, J.G. Strijdom Collection, A2, Volume 60, H.F. Verwoerd - J.G. Strijdom, 18 November 1954; [ Links ] Schoeman, My Lewe in die Politiek, 203-4. 149 Schoeman, My Lewe in die Politiek, 205. 156 DFM, 1/1/3110, E.G. Jansen - D.F. Malan, 1 December 1954 [Translated from the original Afrikaans: my translation] [ Links ]. 157 DFM, 1/1/3109, D.F. Malan - J.G. Strijdom, 30 November 1954 [Translated from the original Afrikaans: my translation] [ Links ]. 159 DFM, 1/1/32689, Danie Malan, Herinneringe aan my Vader, 83. 160 Smit, Aandskemering op Môrewag, 1-6.